Product design work for the core SurveyMonkey product experience. SurveyMonkey users need a way to collect payments from their survey respondents. The primary use cases for this feature are donations, trade show purchases, ticket sales, and fundraising. In order to satisfy the various use cases for this question type, we decided to design two distinct flows for collecting payments within surveys. The "simple flow" allows users to add payment to their surveys by charging one fixed price for an item at the end of the survey. This flow is perfect for allowing survey creators to sell tickets to events, individual items, or charge a fixed donation. The "complex flow" allows users to assign prices to existing survey questions, such as multiple choice, in order to give their respondents options for purchasing within the survey. 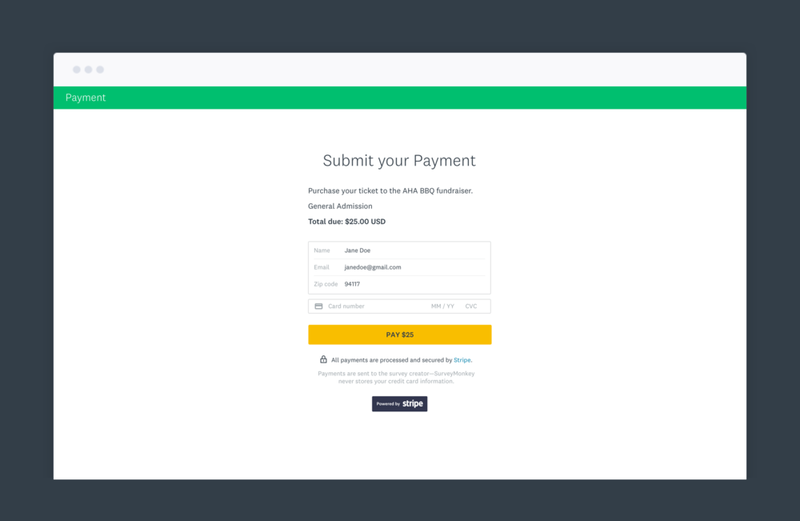 We partnered with Stripe to support the user experience of collecting payments at the end of the survey via a dedicated payment page. We validated this design approach in a usability testing phase, in which we tested how intuitive the payment question create flow and respondent experience was. I designed all states for this feature - including the question editor states and respondent states for all supported question types. As the core SurveyMonkey product becomes more robust with more options and feature offerings for making great surveys, the survey creation UI started to feel very overly crowded, hard to parse, and disorganized. Challenging the previous (and outdated) accordion UI, we tested two different navigation schemas with our user base to figure out what made the most sense for survey creators.